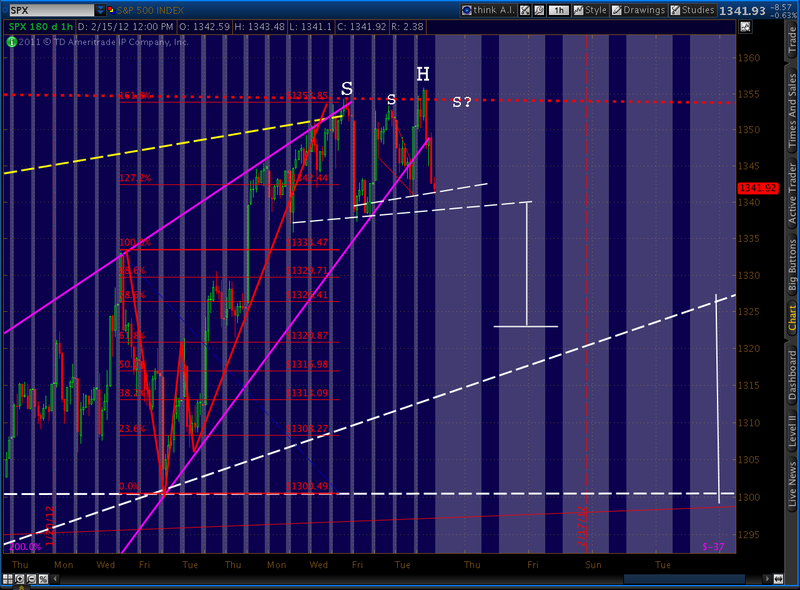 Revised H&S; picture for SPX. 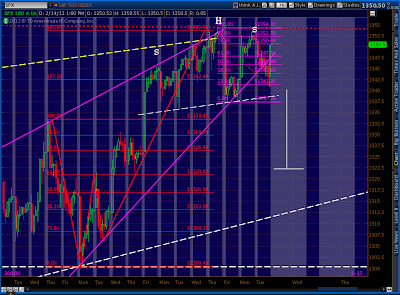 Whether this holds or not, we’ve clearly broken down below the rising wedge. 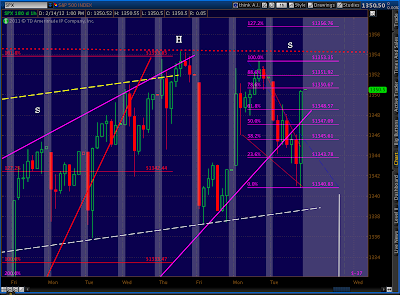 The trick will be to close below it and, specifically, below yesterday’s low of 1340.83. 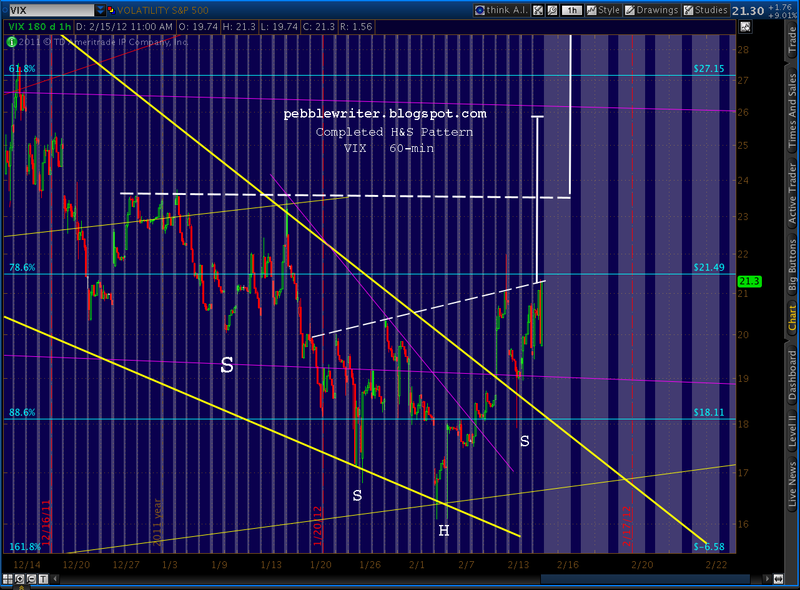 VIX just completed the IH&S; pattern we’ve been watching for several weeks. The nominal target is 25.85 — more than enough to feed the next biggest pattern up the food chain. This, in turn, will feed a bigger pattern, etc. See the big picture repercussions here. 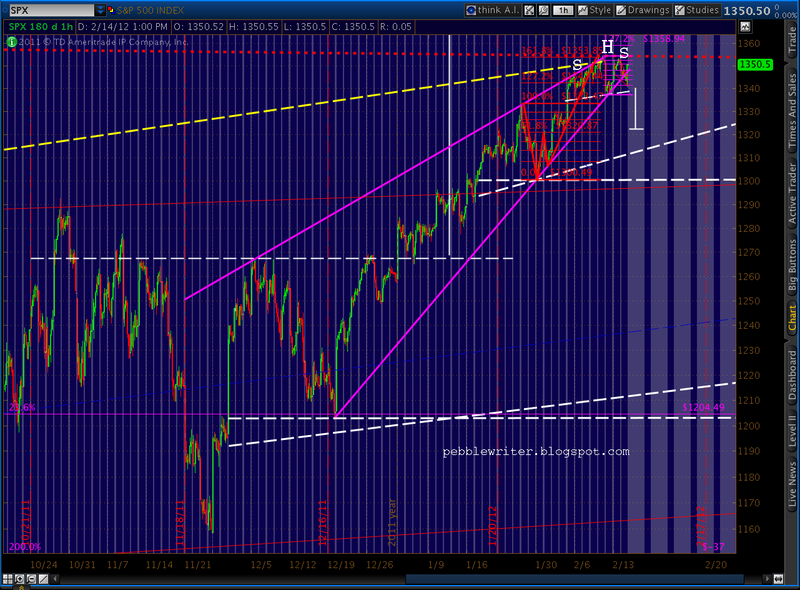 This should get things going for SPX, currently off 4.64. 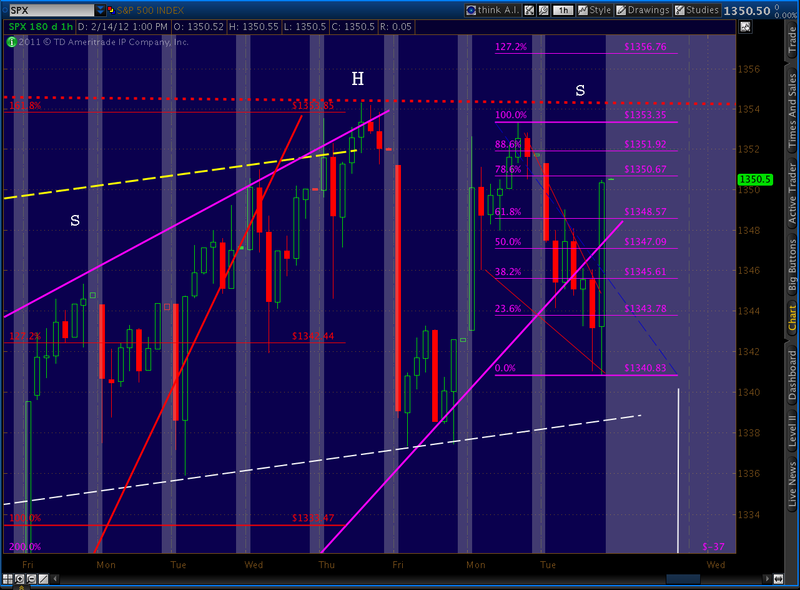 If we close below 1340 today, 1355.87 will look like the Wave 2 top. It’s 2.02 above the 1.618 extension on our latest Butterfly pattern (from 1333 to 1300) and is a remarkable 95.03 retracement of the 1370 – 1074 decline. 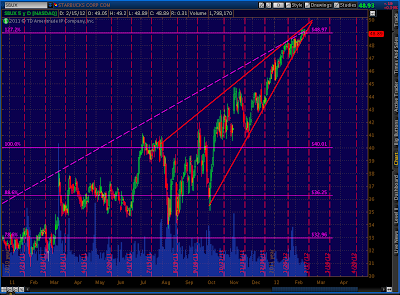 Looks like a beautiful shorting opportunity in Starbucks (SBUX.) I can’t resist the Mar 46 puts at .42. AAPL off to the races again today. A reminder, 529.25 is the 2.618 extension on the big Crab pattern we’ve been watching [see: More Crabapples]. 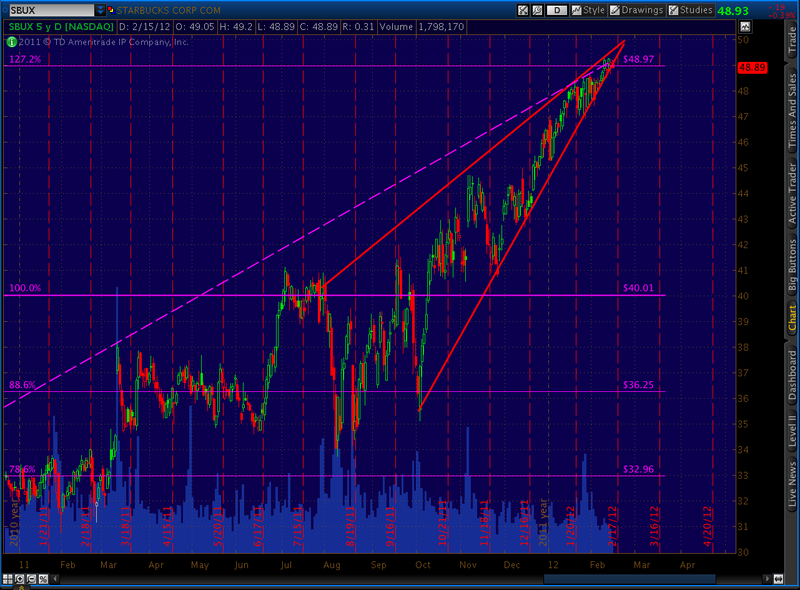 We’re also in nosebleed territory, having poked up through the trend line that dates back to 1994. Look for a serious reversal, maybe enough to mark the top. Well, that has to be one of the weirdest openings I can remember. The futures were fading fast as the opening bell approached. The cash market had little to no momentum at all, having reversed off the Butterfly pattern I discussed in the prior post. It fell from 1358 to 1350.75 from 7:30 to 8:15, feeling trés motive, BTW. 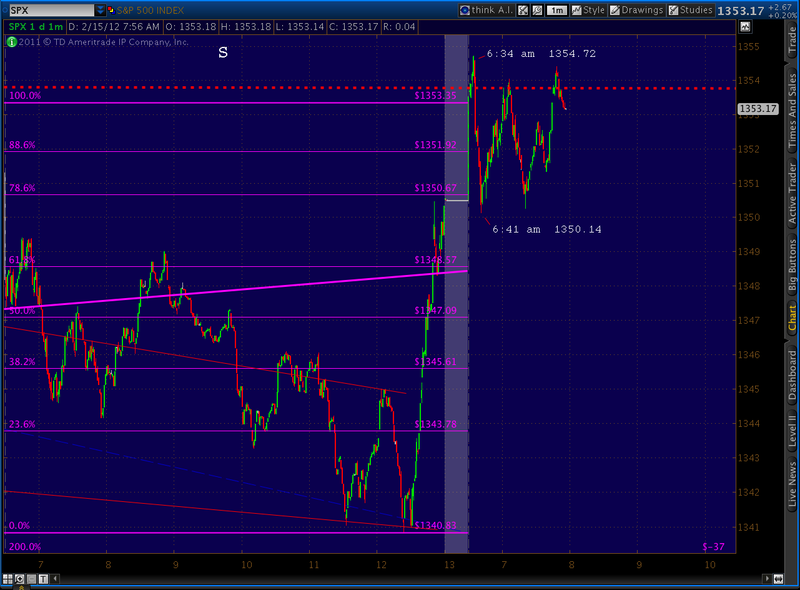 We saw a 50% retrace back to 1354 from 8:15 to 9:13; then, another motivey plunge got going. 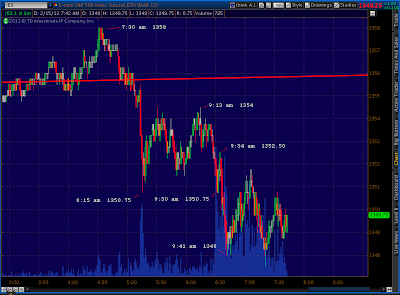 As 9:30 approached, the eminis were at 1350.75 — well below the head of our H&S; pattern — and heading south fast. 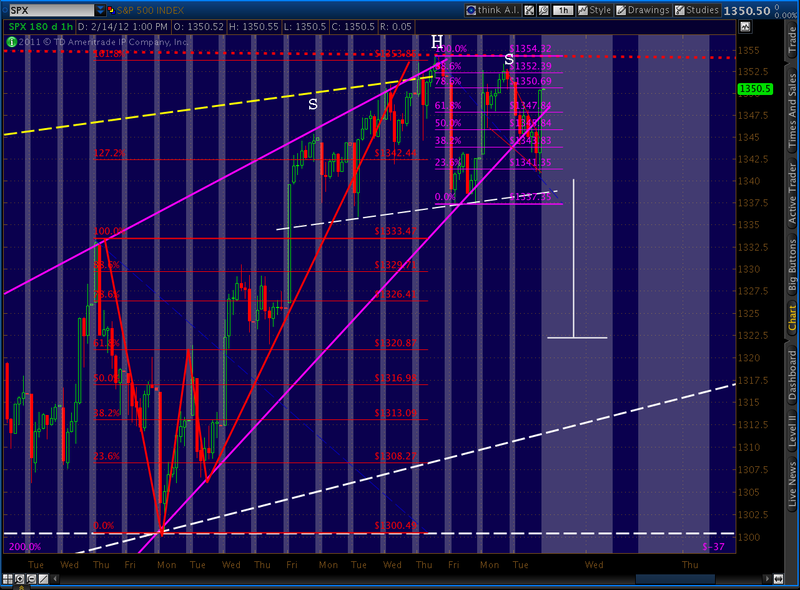 With any luck, the pattern would be left intact and we could get started wrapping up Wave 2. If only life were that simple. The cash market opened and market makers, recognizing the huge shooting star being formed in SPX, freaked out. Not being the types to let a bearish pattern stand — especially with OPEX coming up in two days — they threw everything including the kitchen sink into the market. They ramped. What should have been a down or flat opening (futures were at 1350.75, versus yesterday’s cash close of 1350.34) and pumped it up to 1354.72 — 40 cents higher than the previous close and perfectly good H&S; head. 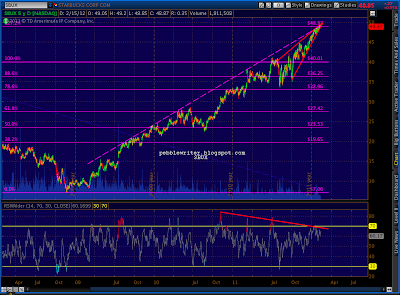 Does it kill the H&S; pattern? Yep. It certainly sows seeds of doubt into the EW count, since we now have a higher high — scam turd though it may be. If nothing else, it extends Wave 2 another hour/day/week until something too big to sweep under the rug comes along. I almost forgot to mention…the news snippet that upset the bulls’ apple cart last night. 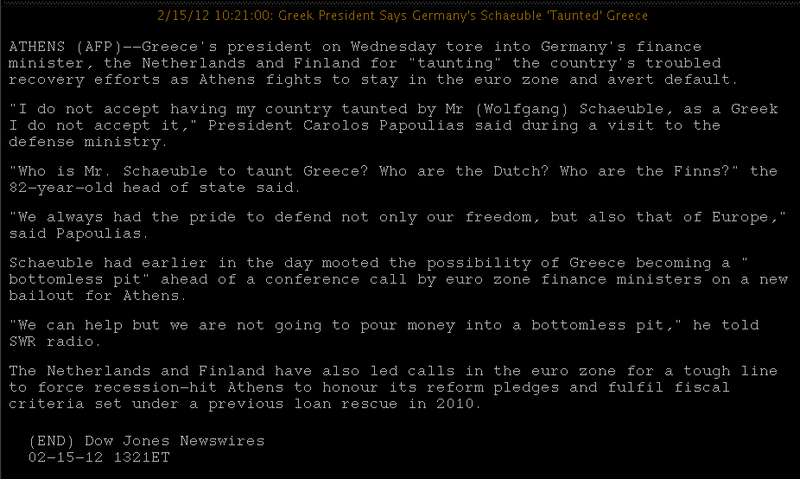 Among other things, it appears that TPTB across the pond aren’t so sure that the conditions they set for bailing out Greece were enough. They’re “mulling whether to delay a full bailout package for the country [Greece] until after the country’s elections.” In other words, they want the pledges of the currently elected officials and those who haven’t yet been appointed elected. This is the EU version of demanding another shrubbery. Demands to cut down the mightiest tree in the forest with a herring are sure to follow. 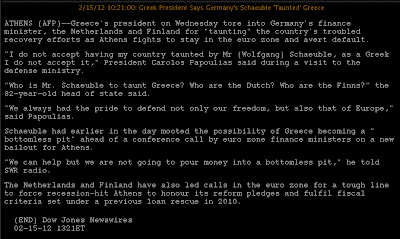 According to unnamed sources, Mr Schaeuble became quite agitated at Mr Papoulias’ reaction. At great personal expense, I have obtained this secret footage of the exchange. I posted the other day about the rising wedge on SPX and, specifically the eminis, commenting: “it has to break down or break out…something’s gotta give.” Well, how about a break down and break out? 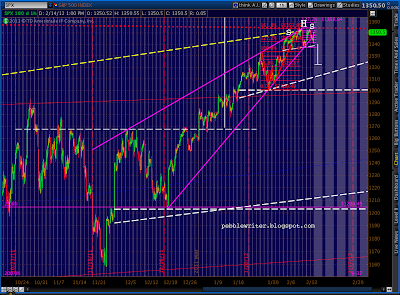 SPX broke below its rising wedge today. 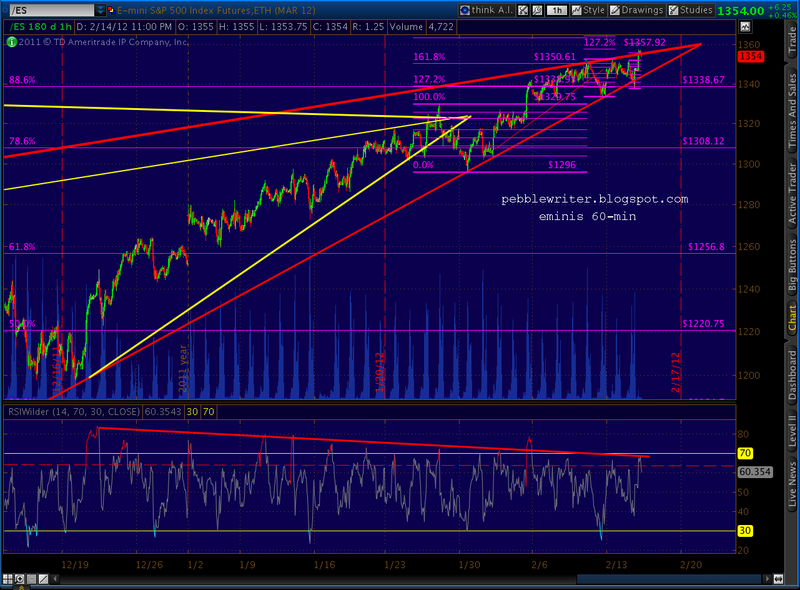 Shortly before the close, it back tested the wedge, looking weak as it did so. Then came the spike. Apparently someone leaked the news that the Chinese had decided they could solve the world’s financial problems (or, at least Europe’s) and SPX spiked almost 10 points in a jiffy. By the time the news was actually released several hours later, the eminis had spiked another 11 points. As I write this, they have rallied so far as to complete a little Butterfly pattern at the 1.272 extension at 1355.75, so don’t be surprised if the whole thing reverses back to GO. Looking at the cash market, the level at which we open matters a lot. 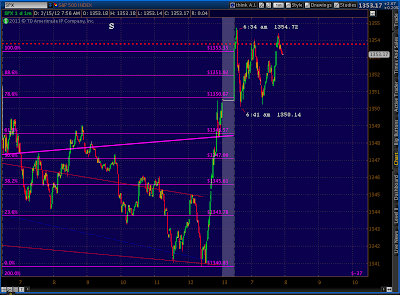 If we exceed 1354.32, the H&S; pattern craps out — not the end of the world for bears, but it changes the count a bit. 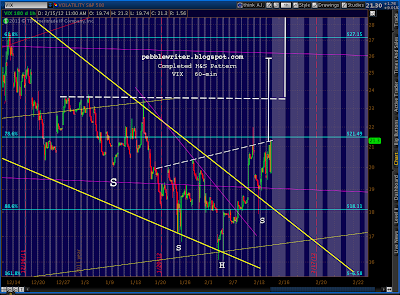 Many EW practitioners have been calling for a slightly higher 5th wave to end Minor 2. 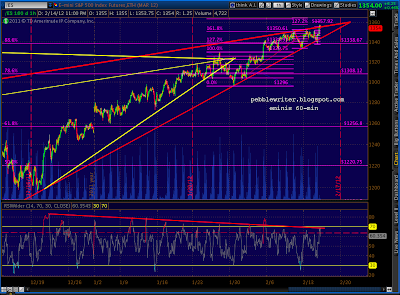 As long as we stay below 1370, all is well in Elliott World. I wish I understood more astronomy-related stuff. I take it you see indications of downturn tomorrow, and that's good enough for me. debatable whether the SPX made a new high or not — for now anyway…but if you look at the RUT chart…not even close! 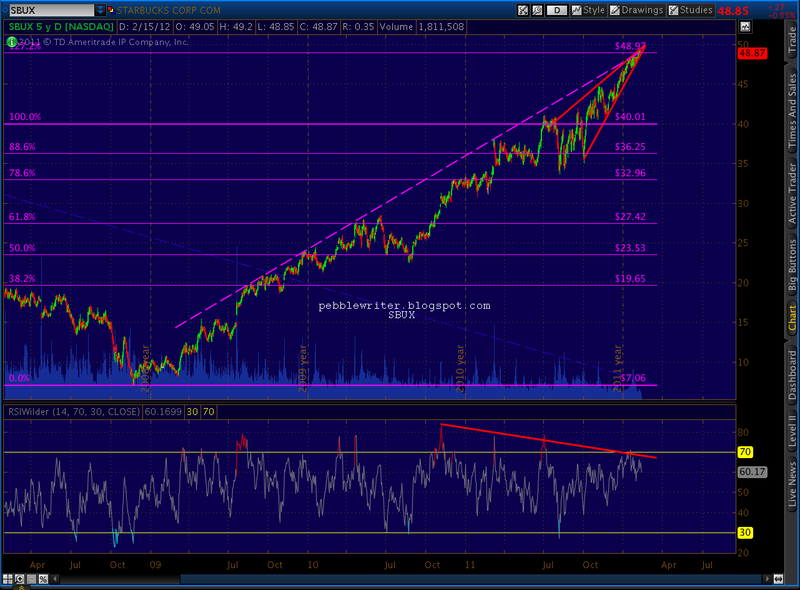 AAPL is going crazy. only $5 away from your 529 target. 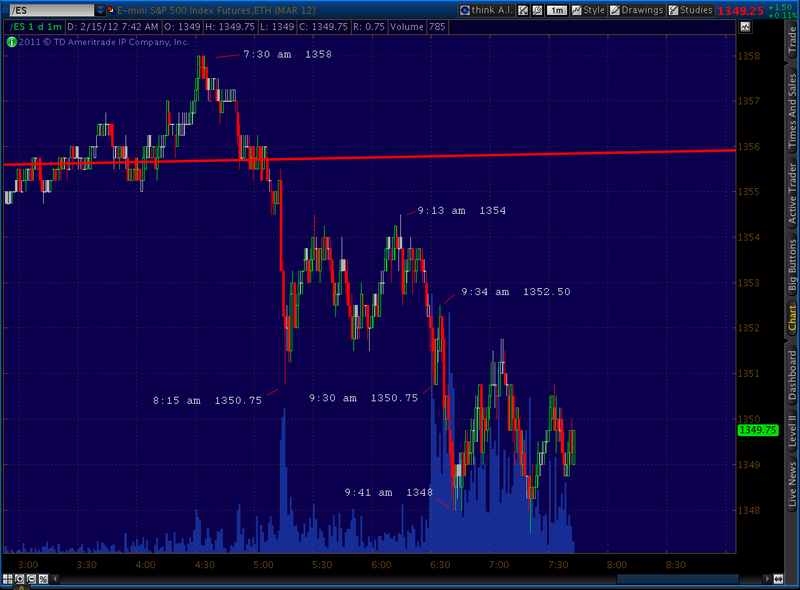 Insane..
so we passed 1354.32 today, does it need to close above there? or the whole wave count is diff now? 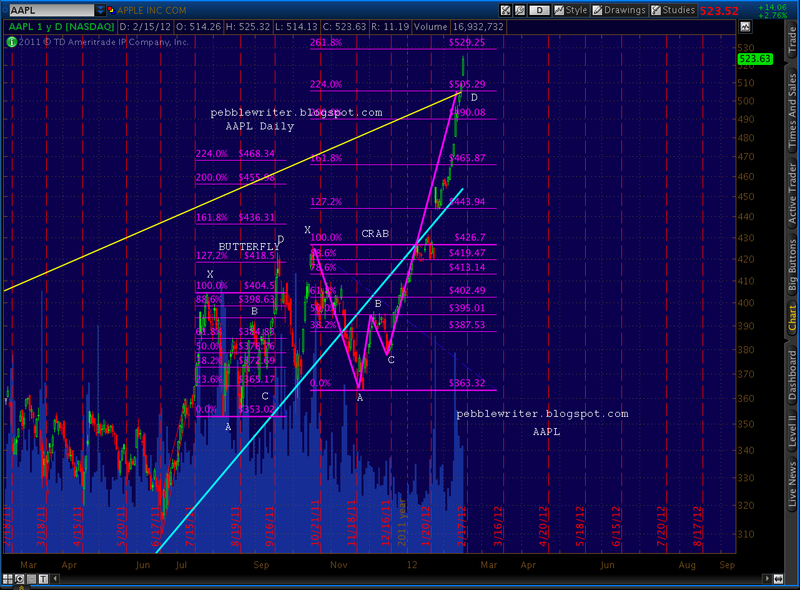 Not to mention the chart of AAPL starting to look like swiss cheese.Who in their right mind has been buying it? Dare I say it, VIX and inverse ETF's showing positive divergence on big volumes. Tomorrow, 16 Feb, there is a F8(135.2025 cd, sqrt(21) = 4.583 moon cycles) and F6(83.4487 cd, sqrt(8) = 2.828 moon cycles) spiral calendar cycle due, pivoted from the 4 Oct and 25 Nov 11. Both of these two previous lows were associated with lots of emotions, thus 16 Feb should be emotionally linked with these two dates. The CB's are winning this battle and the sea of liquidity( take a look at the amount of liquidity from our European friends since Oct) is overflowing into the market. At some point QE3 will go the way of 1&2 and fail, until then this market seems destined to push the bears to breaking point.